You're looking at a screenshot from a video taken of what's been dubbed the long-arm squid. But you also might be looking at the adult version of a bigfin squid. 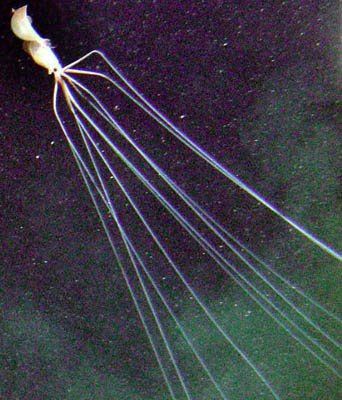 The bigfin squid (Magnapinna s.) is a cryptid, meaning it is an animal for which we have a dearth of information. Specifically, we have only *officially* seen its larval, paralarval, and juvenile stages. No one can confirm that they've seen the adult stage. But we *think* we have. Magnapinna is Latin for 'great fin'. This squid earned it because the fins on its head are very large, with distinctive morphology. So when researchers encountered this squid seen above (and in the video below), they saw the fins and thought, hey, we just might have found an adult Magnapinna. They hadn't expected the long arms (elastic, and reaching a length of 15-20 times the mantle length). That's why the young ones have the name bigfin, and the adults the name long-arm. But the 'adults' have only ever been captured on film, and so have never been studied beneath the scalpel and microscope. Not until then can we confirm any link between the two cryptids. Watch out for this video; it's flickery, has the feel of the beginnings of a horror film, and the squid reminds me at first glance of the queen alien from Alien. Thanks for the squid, Christopher. And Happy Halloween. Once again I'm going heavy on the spider posts. But this one might have some redemptive qualities to it. 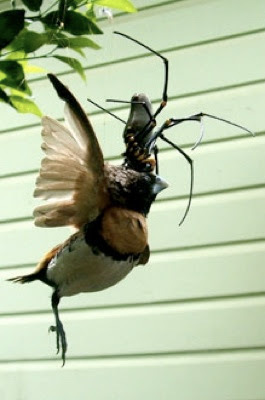 A short while ago we read about an orb weaver dining on a bird, and then about a spider that jumps on people and bites them. But how do you feel about a vegetarian spider? Quite a bit better, I imagine (unless you're a plant). It turns out that a certain population of Bagheera kiplingi (yes, named after the black panther in Kipling's Jungle Book), a species of Mexican jumping spider, dines on the Mexican Acacia tree almost exclusively. Scientists documented their eating habits and found that out of 140 meals, 136 of them were plant-based. What were the other four meals? Well, they snatched ant larvae from passing ants. Okay, that's not so charming. But still. This is the only known group of spiders to have an almost completely vegetarian diet. I love jumping spiders since they don't trigger my arachnophobia. And finding one that eats tree bits, well, that just makes my day. Thanks, Peter. Time for a new word: polyextremophile. This means, in quasi-Greek, one who likes several extremes. I stumbled across this word while researching the water bear (Tardigrades). 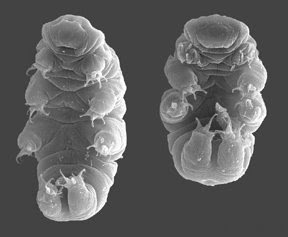 Water bears are not only worthy of their own plush toy, but are marvels of biological engineering. They are microscopic (some species, of which more than a thousand have been described, can reach 1.5mm) plant or bacteria eaters. But what makes them stand out is their tolerance of extreme environments. They are unique in the animal world for being able to tolerate and sometimes even thrive under such conditions as: 303 degrees F (151 degrees C), altitudes of over 6000 meters, oceanic depths below 4000 meters, both poles, the equator, cold approaching absolute zero, 1,000 times more radiation than any other animal, and even the vacuum of space (a very useful trait for those water bear cosmonauts). They are found everywhere. We can all learn a good lesson in tolerance from the water bear, my friends. Is it just my twisted mind, or does all this talk of water bear toughness trigger thoughts in you about how you might go about killing one? 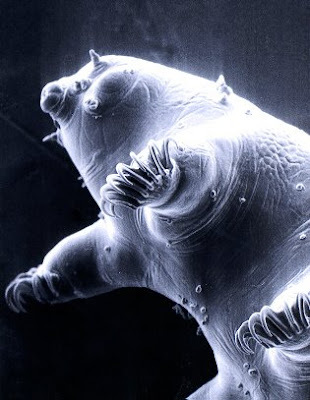 Poor little water bear, you pose no threat, are invisible to the human eye, and were even endowed with an endearing name, and yet still you have at least one human contemplating your destruction. Thanks for the new critter, Morgan. Increasingly mild weather in the UK may seem like a good thing to those who hate the cold and rain. But like everything, even mildness has its price. And the price in this instance may be too high. Spiders. Spiders galore. Alien spiders from alien shores arriving in shipping crates and boxes are now able to enjoy the warmer climate, whereas before they were killed off by the cold. 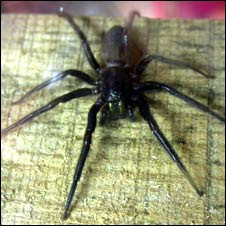 Brits are reporting seeing new spiders all over the place, from false widows to black widows, and other exotic arachnids in between. Here's a shot of Judy's favorite (thanks for the article, Judy). It's of a tube web spider (Segestria florentina). This species is making its way northward up the island and is known to be very aggressive. If approached by a human, it will rear up, bare its fangs, then leap and bite. That's what I expect out of every spider I see, so this comes as no surprise to me. But still, enough already. Tighten up those shipping regulations, UK, if for no other reason then to appease arachnophobes and would-be tourists like myself. This is one record I hope doesn't get broken again (I'm not a fan of enormous insects). British scientists have confirmed the discovery of Phobaeticus chani, aka Chan's Megastick. Native to the island of Borneo (of orangutan fame), this insect measures in at almost two feet long. What's interesting is that the specimen below has been part of a bug collection for almost thirty years. But only recently have scientists confirmed its new species status. I don't know if anyone has studied a living specimen. If not, I can understand. It's hard to find rare bugs that are masters at disguise, especially with raucous orangutans harassing you wherever you go. Hmm. How would you find another one? Is there anyone dedicated enough to this megastick to want to devote years of their lives to finding it? I'd probably offer a cash reward to whoever brought me a living one. But then you'd have a bunch of bounty hunters roaming the rainforests of Borneo. Maybe we should just let this one be. I stole the title to this post because I loved it so much (and I couldn't think of something better). Turns out not all barnacles are conical-shelled crustaceans that began life as free-floating plankton. Some barnacles are the scourge of any crab they encounter. 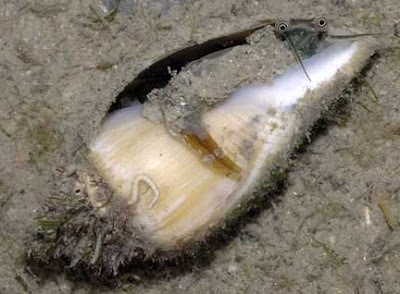 When the female Sacculina barnacles invades a crab's body, she does so in an amorphous gelatinous form. She then sends roots throughout the crab's body and begins to feed on it while she grows into a tumorous growth. She even carves out a little spot (the barnacle equivalent of a studio apartment) for the male Sacculina so that she might have baby Sacculinas. But the barnacle doesn't stop there. She seizes control of the crab's mind and forces it to do her bidding. The crab ceases to grow and looses the urge to mate. Instead, it unwillingly devotes itself to caring for the barnacle's eggs, using all of its time and resources to do so (disciplining the barnacles youngsters when they get rowdy, reading to them, singing lullabies just before nap time, etc.). 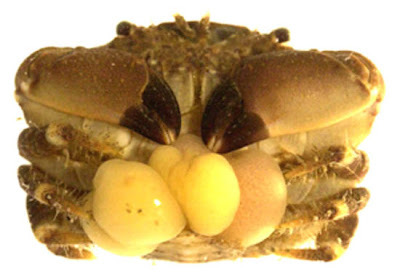 The barnacle even alters the physiology of a male crab so that it becomes a female, so that it might better tend to the eggs. Come on. I know all creatures need to make a living, but some just take it too far. Some parasites manage to be beneficial, and some become tongues. This one just owns its host in every conceivable way and then discards it. My neighbor has a mooching, parasitical son, who I now suspect might be a variant of the Sacculina barnacle. Cymothoa exigua has the dubious distinction of being one of the only parasites on the planet that actually replaces one of the host animal's organs. 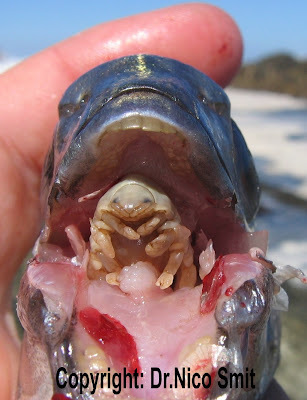 Upon entering the spotted rosesnapper's mouth, the nubile sea louse attaches itself to the fish's tongue and starts feeding off the tongue's blood. As C. exiqua grows, the tongue atrophies and falls off. But the sea louse remains, firmly grasping the stump of the tongue. 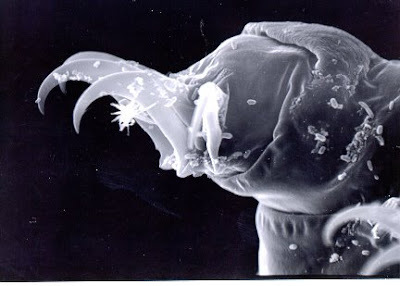 The fish is actually able to move and use the sea louse as if it were its own tongue, and sustains no additional harm. From what I've read, C. exigua only latches on to the spotted rosesnapper's tongue. How does such a specific parasitism arise? Are they too good for other fish? Is there something extra fancy about spotted rosesnapper tongue? I imagine that when spotted rosesnappers go out on dates, one of the first things they ask each other--certainly before the first kiss--is if they have a sea louse tongue. That might be a deal breaker for some. I came back home from the hospital (with new baby boy and happy mommy in tow), only to find my inbox deluged with links to one of the most horrifying pictures I've had to post. You're looking at a Golden Orb Weaver dining on a snared chestnut-breasted mannikin, near Atherton, west of Cairns, Australia. 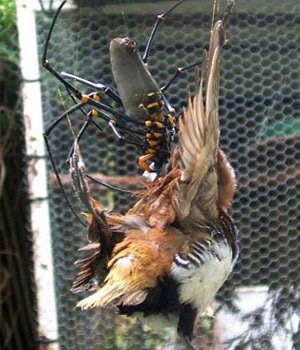 The photo is real, that bird is spider food, and that spider is now a permanent resident (demi-lord) in my ever growing nightmare-scape. 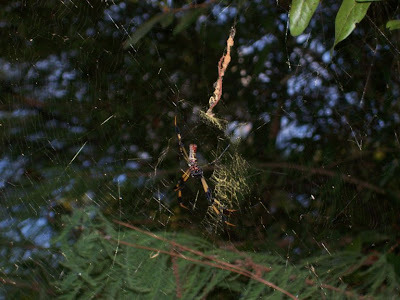 Golden Orb Weavers don't typically eat birds, but that's small consolation to the erstwhile mannikin. Christiaan, Peter, Ida, and Liz. I apologize for the lack of posts. My wife just gave birth a couple of days ago to our son (the clan keeps growing! ), and life has gotten crazy. I was going to keep up on the posts, but we came home from the hospital only to find that my wireless router was dead. I've hijacked my in-laws' computer for a few minutes to send out this quick update. More uglies will be rolling out here shortly. I need something to counter balance all of the cuteness at home. 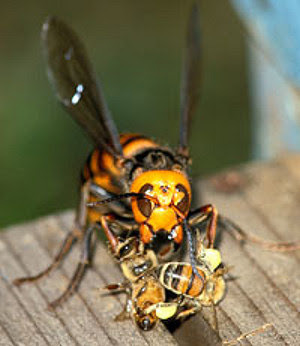 Many of you (myself included) were disturbed by my post on Giant Japanese Wasps, and the utter destruction they can visit upon unsuspecting honey bees (killing every single worker bee before absconding with the bee larvae). One thought I had was, why aren't the bees defending themselves? Turns out bee stingers aren't strong enough to pierce the chitinous hides of the wasp. 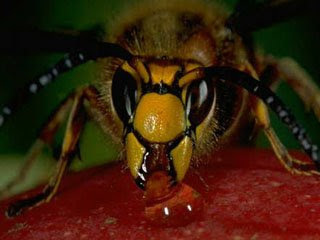 But native Japanese bees have developed a very effective response to the wasp attack. The Bee Ball. The tactic: when a wasp is first spotted, about 100 worker bees hang out by the hive opening and keep it open, thereby luring the wasp inside. 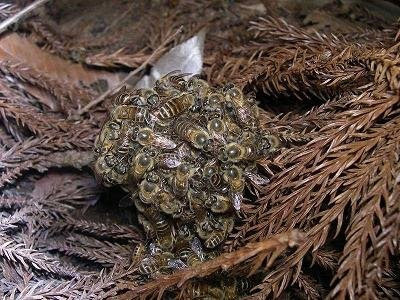 Once the wasp has entered, 500 bees, who were lying in wait, swarm the wasp and latch onto it in a bee ball as seen above. The bees then begin to buzz and flap their wings, raising the temperature inside the ball to 47 degrees celsius. The bees can tolerate the temperature just fine, but the wasp has already reached its fatal limit at 45 degrees. The bees literally cook the invader to death. Honey bees FTW. One more reason to keep a special place in your heart for the little honey makers. And one more reason to steer clear of group hugs. Thanks for the link, omgwtf. 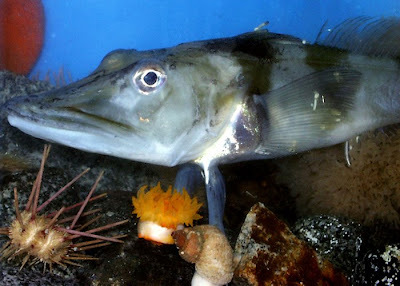 Anarctic icefish are the subject of study in the war against a host of bone diseases. It turns out that these fish, who live their entire lives in southern waters whose surface doesn't go above freezing, have some interesting traits. They have no red blood cells--a liability in freezing temps. And, they've largely shed their skeletal system. Their native frigid waters are energy poor, and since bone is dense, not having much in the way of bone allows them to use less energy to maintain their bouyancy. Clever little icefish. So, why do humans care? Because if we can pinpoint exactly how and where the icefish developed this lack of mineralizing of their skeletons, we'll be better able to understand our own mineral deficiencies, as seen in diseases such as osteopenia and osteoporosis. And knowledge is half the battle. Give up your secrets, ice fish. Clever or not, we'll make you talk. Hunters come in all sorts of packages, ranging from the sleek jaguar of the Amazon to the wolf packs of North America to the...the velvet worm. 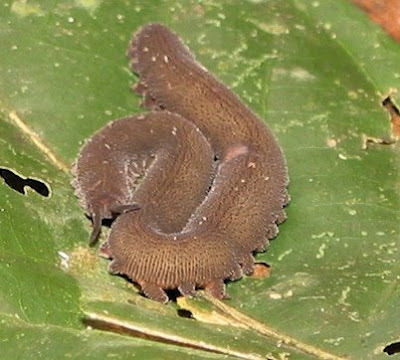 The velvet worm is neither velvet nor a worm. These small hunters (ranging from 1 inch to 1 foot in length) belong to their own little phylum of Onychophora. They move like caterpillars (similar speed too), but their 'feet' (which again, aren't feet--they're called lobopods) move through hydrostatic pressure, since these critters have no skeleton and little in the way of musculature. Q: So, what do they hunt? Q: Ah, but how do they hunt? A: When they spot prey, they spray a sticky substance at it, at a distance of over a foot and a half if needed. The goop quickly congeals and cements its prey to the ground, giving the velvet worm the opportunity to eat at its leisure. 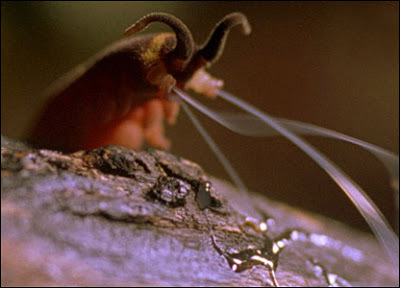 The velvet worm undulates up, bites the prey with its mandibles, and injects its own blend of digestive juices, which liquefies the innards of the prey. The velvet worm then slurps up the invert-gut-gruel. Q: But how does it access the gruel? A: By rasping its prey with its tongue that is covered with sharp teeth. I'll stop asking questions now. I don't like where this line of inquiry is going. Stare into the squirrelly eyes of the conch. There are oodles of different types of this marine mollusk, some of which are true conchs, some of which have elaborate shells that lend themselves to use as horns by youths trapped on an island inhabited by pigs, and some of which have the crazy eyes you see below. I think Jim Hensen used these as inspiration for a lot of his creations. Thanks for the photo, linty. Neil photographed this meta-crustacean on the beach at Cayucos, CA. It's a purple shore crab (Hemigrapsus nudus), covered with barnacles. Did you know that barnacles are crustaceans? I didn't, until Neil told me. Turns out there are 1,800 or so species of the sessile suspension feeders. I agree with Neil's assessment that the barnacles didn't pick a very good place to settle. They'll be cast aside when the crab molts. When will barnacles ever learn? Thanks for the crab, Neil. Here's a picture of my own hand holding what might just be a purple shore crab. But since there are a variety of small crabs that inhabit the western shores of North America (from British Columbia to Baja California), I can't be certain. The little crab was cast back into the tidal pool from whence it came. Taiwanese fishermen caught a 3.5 meter fish off Taiwan's east coast. The fish is a Regalecus glesne, also known as the King of Herrings (it's good to be king, but of herrings?). Considered to be the largest of the bony fish, it lives at depths of up to 1000 meters. So why were fishermen able to catch it? We don't know -- but the fishermen have an idea. They think the fact that the fish came toward the surface means that an earthquake is imminent. Well, only time will tell. Still, though; don't the fishermen know that you don't kill the messenger? Thanks for the video, Marshall. 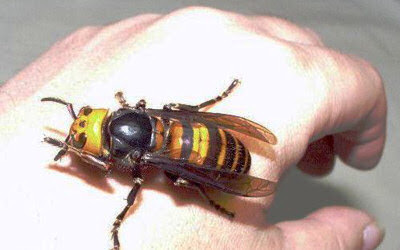 I've posted on the Japanese Giant Hornet before. But Erik has forwarded an article which sheds a bit more light on these enormous insects that must be shared. First off, they're huge. As big as a man's thumb. That's a game ender right there. Secondly, their eating habits. They love honeybees. In fact, if a hornet finds a hive, it will spray it with its acid/phermone spray and summon its own hive mates (about thirty individuals). Over the next couple of hours, this small tactical team can literally dismember an entire hive of thousands of bees. They rampage through the hive, tear every living bee apart, leaving behind only limbs and body segments, and then carry off the bee larvae to feed to their own wasp larvae. Vespa japonica is a freaky insect. Lastly, humans don't want to encounter these in the wild. That same acid spray will be aimed at your eyes. It's a blend of acid and pheromone, the latter of which will summon all nearby wasps to join the stinging fray. Not only will the acid begin to consume your flesh, but the stinging just might finish you off. 40 people die each year in Japan as a result of these attacks. Why the gleam in this young man's eye? He's looking at tonight's dinner. 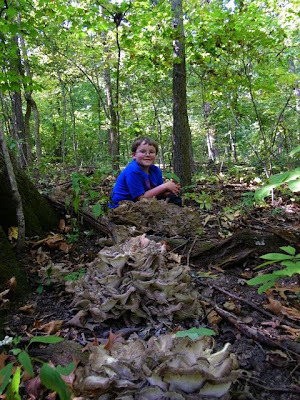 Yup, Carrie and her family were on an outing when, much to their delight, they found a nice crop of Hen of the Woods. Called Maitake in Japan, and Grifola frondosa to you scientists, this fungus is a very popular food. They're known for their fabulous flavor and texture, for being bug-free, for keeping a long time, and for having good health benefits. 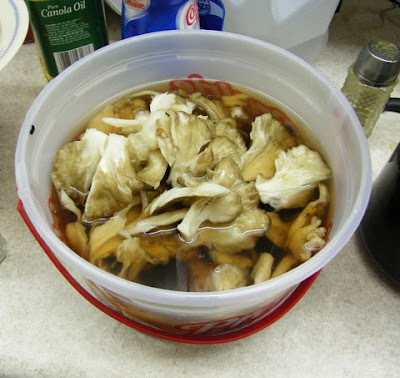 How do you prep and eat Hen of the Woods? 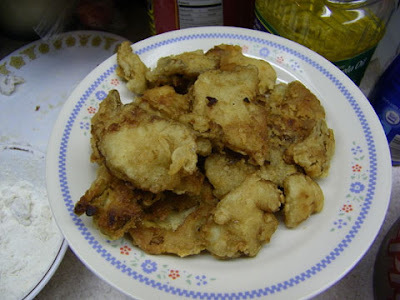 Well, Carrie's family likes to marinate and fry them. I must admit, it looks delicious. 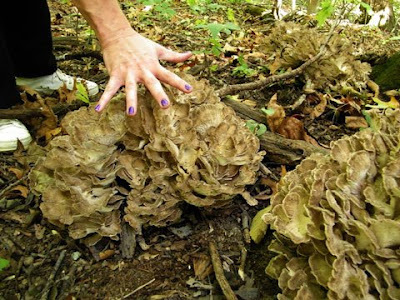 Here's a recipe for Hen of the Woods Salad. If you come across a good crop of this fungus, go ahead and harvest some. And come back next year: more than likely it will have grown back. Thanks, Carrie. For the first time in this blog's history, people might leave with their appetite restored. 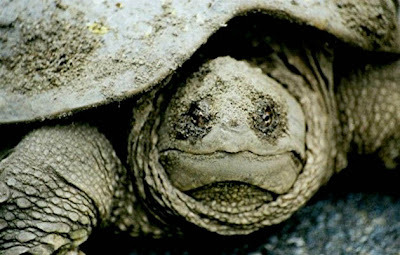 John took this photo of a snapping turtle at Peebles Island State Park, not far from his home in Troy, NY, US. 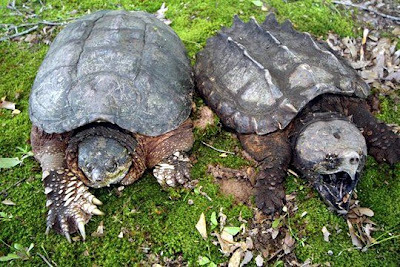 There are four distinct species of Chelydra (snapping turtles). The Northern common snapper, the Florida snapper, the Mexican snapper, and the Ecuadorian snapper. But wait, you say, what about the alligator snapping turtle? Ah, let us explore that question. 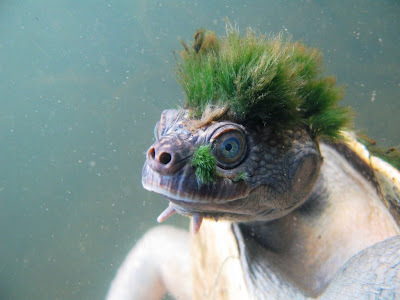 The alligator snapper (Macroclemys temmincki) has a ridged shell, much more of a beak, and they are the only ones with that worm-shaped lure of a tongue. You see, common snappers dine on carrion (one site even says that some police departments use their carrion-sniffing skills to find corpses, but I need corroboration). But the alligator snapper uses its tongue to lure live fish into its beak. ...wow. I apologize for that geek tangent. I'll sign off now. Thanks for the snapper, John. Why is this bee restrained and being (punny!) assaulted by a cotton swap? It's easy. It's being trained to sniff out something other than nectar. Why? Because bees (and wasps) make for amazing scent detectors. 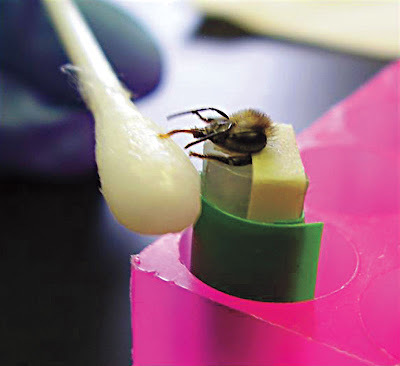 Researchers at Los Alamos National Laboratory in New Mexico are working on creating portable teams of bees that can sniff out almost anything with a scent. Want to find a bomb? Bring those bees that have been trained to locate TNT or fertilizer. Want to search baggage or an apartment complex for drugs? Easy, just bring your drug-sniffing bees along. It turns out that bees are easier to train than dogs, don't get tired or bored easily, and are often much more accurate than electronic devices. The University of Georgia has a similar project going, called the Wasp Hound (hey, AKC, we need a breed of dog called the wasp hound--get on it). And the British government is working on an insect-based system for searching out bombs and minefields. But wait, how do you follow the bees? They fly at 15 miles an hour and are quickly lost in a crowd. The ingenious solution: train the bee handlers on how to read bee behavior. Place five bees in a box, and watch the video screens as the cameras inside watch the bees tell you where to go as they buzz and prance about inside the box. Voila, you've got yourself a portable, box-shaped, bee-driven bomb sniffer. I recommend reading the full article. It really is amazing. Thanks, Judy. When you're talking about a red-tailed boa, you're usually just talking about the common boa constrictor. 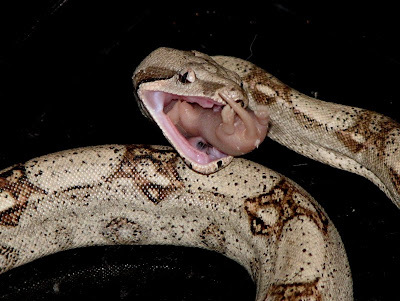 The red-tailed boa was so named by folks in the pet industry as a means of shedding the name (pardon the pun) 'constrictor', which doesn't lend itself to good sales figures to parents who want to buy their kid a new pet. The boa constrictor is one of the few animals whose common name is the same as its scientific binomial name (Boa constrictor constrictor). If you do decide to own one, as with all prospective pet owners you need to know what you're getting yourself into. You'll start out with a manageable snake that feeds on pinkie mice and rats (like in the photo of Eva the Boa below). But you'll end up with a reptile that will get to 10 feet long, weigh 50 lbs, need a couple of small rabbits a month, and regular handling to keep it tame. And don't think you'll be able to unload it once it's full grown; the zoos and animal shelters have too many full grown snakes as it is. But what if you encounter one in the wild? Well, you better hope you're in South America. Those boas tend to be tamer. It's the Central American ones who are the hissers and biters. Why the regional difference within a single species? Don't know. Maybe something in the agua. Thanks for the photo, Robin. Lee Ann went on a road trip this summer and snapped shots of some of the critters she encountered. Here are but two of them. I've looked into the eyes of an elephant and sworn I saw an intelligent mind looking back at me. I've looked into the eyes of a puma that was being walked past me within a couple of feet and sworn I saw unmitigated malevolence. But I've had zero reaction when looking a slug in the eyes. I believe you are now looking a black slug (Arion ater) in the face. 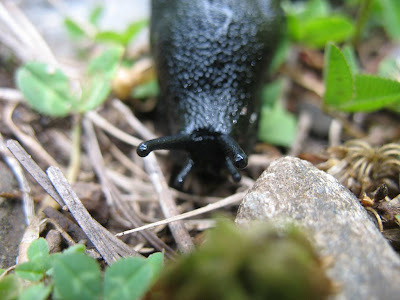 Also known as the black menace, this slug is an unwelcome addition to any lawn or garden. Their nasty-tasting slime is a deterrent to most would-be hunters, but some animals still hunt them (can you really hunt a slug? at least, with any pride in calling it hunting?). Just keep some hedgehogs or badgers in your garden, and voila, no slugs. But then you're stuck with pesky hedgehogs and badgers. 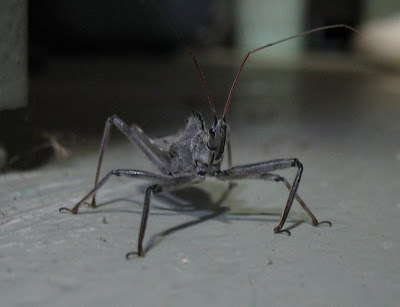 UPDATE: there is a consensus among readers: The second bug is a wheel bug. Don't ever trust me to come up with a good bug ID. I'll go flagellate myself now. Last we have a gray bug from Pennsylvania. I think it's some variant of a squash bug. But there are roughly 1,800 species in the Coreidae family, so I can't get more specific. Suffice it to say that this bug probably just dined on *gasp* a squash or other food plant of some sort. Again, no emotional reaction from looking it in the eye. Maybe that's just my 'higher order animal' bias. I'm such a bigot. 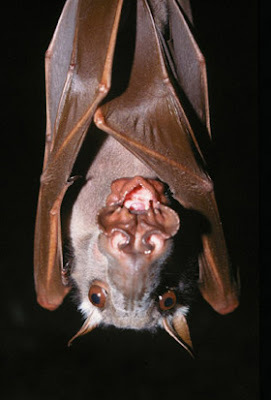 Bats belong to the order of Chiroptera, which means "hand-wing". But did you know that there is also an order by the name of Dermoptera, "skin-wing"? (Think of the suffix "opter" and you'll get a clue as to how the helicopter was named). There are only two critters in this little order. Here's one of them. The Homely Halls of Ugly Overload would like to welcome the Colugo. Morgan, who is studying biology in Paris on a level that would make my head spin, informed me (and by extension, you) that recent molecular tests have shown the colugo to be the next of kin to primates, which bumps the shrews and their ilk to third place. 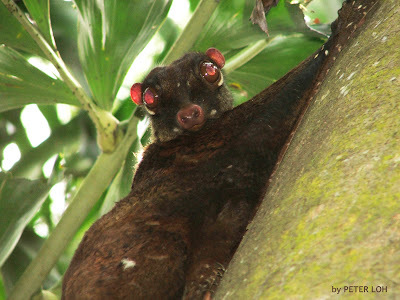 The colugo is a native of Malaysia, and is also known as the Malaysian flying lemur. 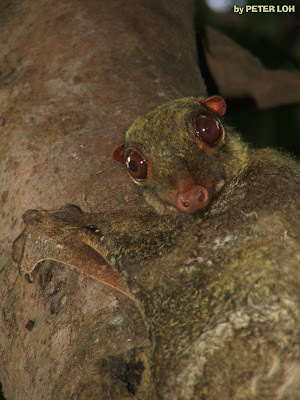 But, much like Voltaire's assertion that the Holy Roman Empire was neither Holy, nor Roman, nor an Empire, the Malaysian flying lemur is neither flying nor a lemur (though it is Malaysian). These arboreal mammals, which are about the size of a house cat, have flaps of skin along their sides that allow them to glide, some times as far as 200 feet. These flaps of skin are how the colugo earned its way into the exclusive club of Dermoptera (the only other member is a resident of the Phillipines). The colugo is the closest thing we have to the dreaded flying monkeys of The Wizard of Oz fame (oh, the nightmares those things gave me as a youth). But fear not, these creatures are awkward fliers, awkward climbers, and awkward crawlers, and they only eat leaves, shoots, and fruit. That being said, I'm sure some creative witch could put them to some nefarious use, so don't rest too easy. Thanks for the skin-wing, Morgan. I truly hope none of you are reading this an lunchtime, unless you are gifted with some intestinal fortitude or a truly sturdy appetite (one of my talents). But Judy, the forwarder of this article from ScienceNews.org, wanted us Westerners to get a taste...hopefully not literally...of what much of the rest of the world eats. Allow me to introduce you to a new word: entomophagy (en-toh-MOFF-uh-jee). This is the practice among humans of eating insects. This practice has always been popular in many cultures, and is, if anything, becoming increasingly so. 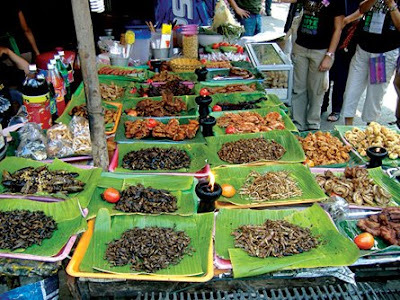 Residents of at least 113 nations include insects in their diet. But before you get disdainful of these folks, understand that most processed foods Westerners eat contain bug parts, even if ground up and in small quantities. For instance, do you thing wine makers are able to clean every grape of the spiders and other creepy crawlies that lived in the vines? No. Your wine contains at least a little bit of spider juice, bird droppings, etc. How about that peanut butter? Or even chocolate? Cereals? Most foods we eat at some point came from the good ol' outdoors, and the outdoors includes bugs. 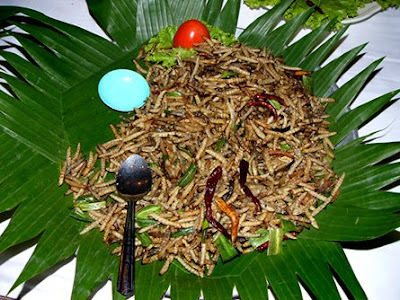 But still, that is different from actively seeking out bugs to eat, such as this Thai salad featuring grubs and peppers. I'm not here to convince you to start eating bugs (though many scientist and entomophagy enthusiasts are). My only purpose is to have you read this article and get grossed out become more aware of this global phenomenon. Thanks Judy. The world just became a bit less appetizing. Or maybe our minds and taste buds a bit more expanded? ... no. My Western-oriented palate says otherwise. I've bitten the bullet and made a few changes to the blog that I've been wanting to do. Namely, I've finally switched over to the new Blogger layout. That's right, I was kicking it old school for quite some time. What does this mean for you? You'll be able to navigate and search the archives and categories with greater ease (more than a thousand posts, now!). Beyond that not too much. But all this digital housekeeping is making me wonder if I should make more changes. Maybe a new header (one with an amalgum of some of the critters I've posted--maybe not), maybe some new features. I don't know. If you have any suggestions, or even the artistic talent to conjure up a new header, I'm open to new ideas. This blog is for you, afterall. Please let me know if you come across any dead links or broken areas of the site. Oh, and feel free to become one of my 'followers' (that sounds so...so...demeaning?). But, I'm stuck with the wording that Blogger uses, so there it is. Thanks a bunch for visiting. I look forward to many more posts. Kat took this picture of the albino alligator at the new California Academy of Sciences in San Francisco, CA. 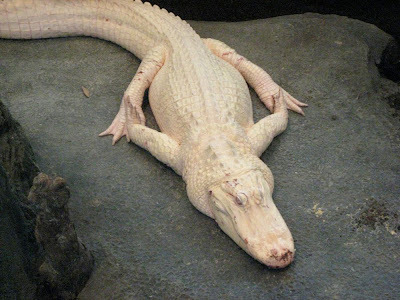 Let this post be a plug for the new museum, and for albino alligators everywhere. The word 'albino' comes from the Latin word albus, which means 'white' (you Harry Potter fans are excited now, aren't you?). The word alligator comes from a corruption of the Spanish word for lizard, which is el lagarto (all of you Florida Gator football fans are excited now, too--maybe not). Albinism isn't terribly uncommon in the animal kingdom (among humans, about 1 in 17,000 will be albino), but survival into adulthood for those who inherited these recessive genes is. It's hard to go unnoticed in the wild with white flesh/hair/scales. Typically, going unnoticed equals becoming food. Trivia for the day: albinism is defined by a lack of melanin. Leucism is defined by a reduction of all skin pigments, not just melanin. Leucism is often bred into pets, like cockatiels and snakes. I once had a leucistic cockatiel who had night frights. Mothra (my cockatiel) found a better home than I could offer her. Carrie has shared with us her spider woes. She's back, but this time with something less leggy. In fact, almost entirely legless. 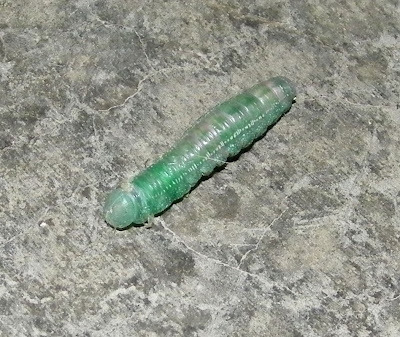 Any clue as to what kind of caterpillar this is? Is there a way of determining from the larvae if it will pupate and emerge as a butterfly or a moth or a fly? By that I mean are there some common characteristics among, say, moth caterpillars that would help us to know that it will be a moth, as opposed to a maggot that is destined for flydom? A lot of you out there are so bold in your insect and arachnid handling, that you've bolstered my courage in my own Encounters of the Invertebrate Kind. Why, the other day I even picked up a praying mantis, and I responded to my nephew's call when he asked for my help in finding his missing tarantula. But then I saw this photo from Aydin Örstan (via Cindy), and I'm back to square one. 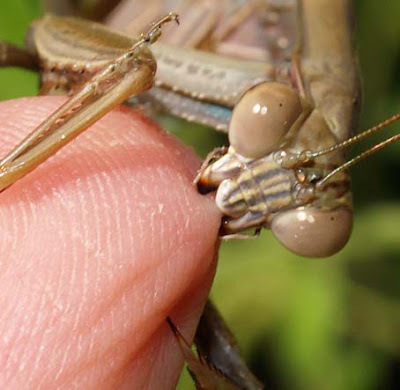 Mantises do bite (at least, they bite the scientists working with them). Thanks for dowsing me with a bucketful of cold reality, Cindy. It's time for another spider gala. 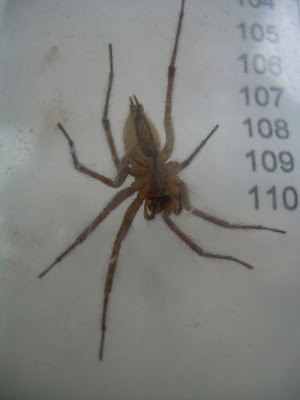 I'm clearing out my to-do box of spiders and sweeping them onto the blog. Enjoy. For any of you arachnophiles, if you can ID these, that'd be great. Hannah's lab has a new resident: Gustav the Spider. He's now living in a pink pipette box, where he is fed a variety of live insects by the lab's students. Hannah thinks it's a member of the Agelenopsis genus - garden spiders. Any takers? Laura gets to look out her window every morning to see this weaver. The web's about two feet across, just big enough to catch the dreams she had whilst slumbering. Shane wanted to send along this 'West Palm Beach Spider.' To give you a sense of scale, Shane would like to point out that that strip above the spider is the husk of what's left of a 40 foot anaconda. Last we have Liz's eight-legged encounter. She discovered this spider (wolf?) lurking behind the glass of the call buttons for her apartment complex. In order to buzz an apartment, one has to reach across this spider. I think I'd prefer to have a bell hop greet me. Ever since I was a boy, I've had an issue with hammerhead sharks being called hammerhead sharks. They don't look like they have hammer heads to me. Maybe a spade or even an axe, but not a hammer. So when Jessen forwarded this photo of a hammerhead bat , I was dubious. But then I saw the photo below, and I was sold on the name (you'll notice that I feel quite a bit of angst over biological nomenclature--talk about borrowing trouble). Hypsignathus monstrosus (love the species name), is a native of the swamps and riverine, mangrove, and palm forests of Senegal and Angola. These two specimens are male, as demonstrated by their elaborate snouts (being a sexually dimorphic species, the females have regular fox noses). For all you wallflowers, or men who have trouble finding dates, be thankful you aren't a hammerhead bat (as if you needed another reason). These bats practice what's known as 'arena mating'. Large groups of them gather around river beds. The males line up on trees in 10 meter intervals and begin calling out and honking to attract the females. With a group of around 150 individuals, this results in some loud vocalization. When a female chooses her mate, the male makes a buzzing noise, they copulate for 30-60 seconds, and then go their own ways. This happens twice a night during mating season. The evening session is usually much more productive, but the females do show up for the 4am round, for all those males who couldn't get their act together earlier in the night. Well, that's nice of the females. More forgiving than a lot of other species (captive mantids come to mind...). Thanks for the photo, Jessen. Karen reminded me of one of my favorite creatures on the planet. 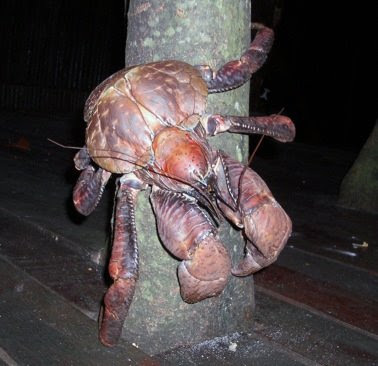 The coconut crab. You needn't worry about encountering one of these in the wild unless you live on one of the several islands in the central Pacific Ocean and Indian Ocean that they inhabit. 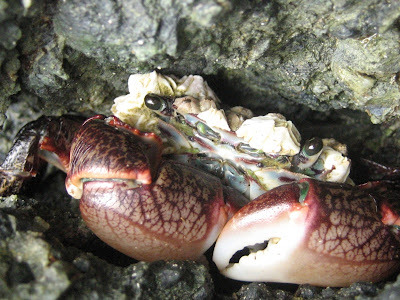 Also known as the terrestrial hermit crab, they are also called robber crabs and palm thief crabs, evidently because they have a habit of stealing shiny things, much like my toddler son. Unlike my toddler son, these crustaceans have a three foot (1m) leg span, weigh in at about 37 lbs (17kg), and are equipped with claws powerful enough to crack coconuts open (they love eating and drinking the innards). Robber crab, you may have my watch. I didn't like it that much anyway. I'm not sure what this crab is trying to accomplish on this pillar. Maybe it's a Samson-style tearing down of the temple. If there was one crab who could pull it off, the coconut crab would be the one. Rasmus, Kat, and Ida forwarded me this link (synchronicity at play). 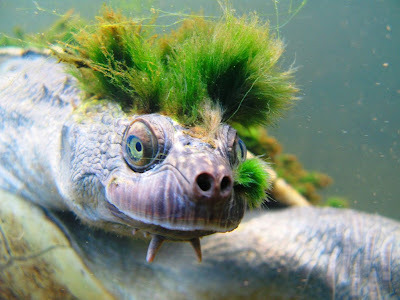 You're looking at a Mary River Turtle whose head (and face and shell) have sprouted a living crop of algae. I imagine these shallow-water dwellers aren't the fastest moving of turtles, which is saying something. The Mary River Turtle is native to, can you guess it, the Mary River in Australia. It's become an icon for the environmental movement down there, as it is threatened, and is further endangered by government plans to construct a dam on the river. What's amazing about this turtle is that it breathes through lung-like structures in its tail. Is the snout cosmetic only? Does it breathe through its tail, or does it breathe through its nose all the way down to its tail? If the latter is true (which it must be), then that puts yoga breathing exercises to shame. Without lungs in its thoracic cavity, that leaves more room for...what? Liver, gizzard, stomach? Or could it be heart? How precious can this little creature get? A big hearted, algae haired, blue-green eyed, yogic, smiling creature that slowly wades through the shallows of a river under threat. I need to sit down and write a children's story. The potato bug is an insect that is on my short list of most dreaded creepy crawlies. Not because they're dangerous (they don't have poison glands), and not because they swarm (they're never found in large numbers). It's because I might actually encounter one in my otherwise benign home in California. 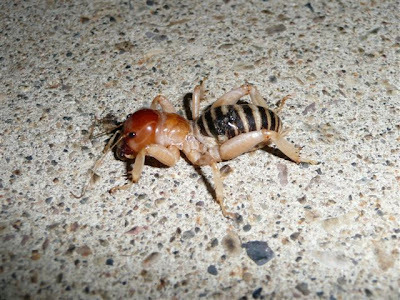 Also known as the Jerusalem cricket (why, I don't know, since they are only found in the western portions of North America), this insect spends most of its life underground where it feeds on dead and living plant material. But they aren't considered a pest (despite being evil), given their modest population. 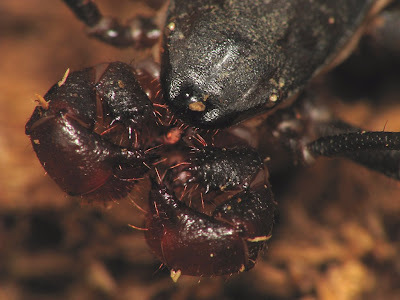 They are large and can deliver a nasty bite (their mandibles are strong, given their application in digging), and their hind legs are covered with sharp spines. Like other crickets, they can be noisy. They drum those spikes on their abdomen. This particular specimen was encountered by Teresa's sister's puppy near the Great Salt Lake in Utah, US. The beast was two inches long, and it hissed at the puppy. The puppy backed away and sneezed, leaving Teresa's sister to wonder if they spray anything. Do they spray? I don't think they do. It was probably just the puppy responding to a nose full of evil. Say prayers for this little puppy. He has also recently had encounters with a tarantula and a diamondback rattlesnake. He needs all the help he can get. Thanks, Teresa. Say hello to Pimento, the most recent inductee to Ugly Overload's run of animals who are otherwise attractive, but were caught in a papparazzi-style moment of homeliness. But Pimento's owner, Anastasia, doesn't mind. In fact, she's proud. 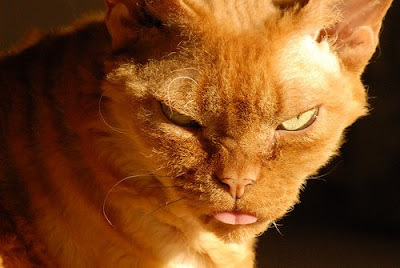 Did you know that cats share something in common with only two other species on the planet, the giraffe and the camel? These three beasts are the only ones that when running do not alternate their gait. This means that they run forward with both right feet in one stride, and then both the left feet in the next. All other animals advance with one right and one left, then one left and one right. From what I can tell, they don't share much else in common with camels and giraffes. Cats really are amazing creatures. They can survive falls that would kill most other vertebrates. They are the perfect hunter. They can commune with the dead and banish mummies. Also, their urine is incredibly potent. My folks tore up their laminate flooring in their dining room, where years earlier one of their cats had made a habit of peeing. Even after all that time, the concrete slab reeked so powerfully that my dad wretched and had to recuse himself from the project for a short while. Thanks for your glam cat Pimento, Anastasia. Lee asked me to post on the vinegaroon, and I aim to please. This is actually one arachnid that I've had some personal experience with. I *almost* handled one when the pet store owner brought it out. But I declined when my arachnophobia seized control of my cognitive functions. Why are they called vinegaroons? Because their defensive spray smells exactly like vinegar (chemically speaking, the spray is vinegar - acetic acid). This largely harmless (to people) variety of whipscorpion has some impressive pedipalps. So impressive, in fact, that they function as full-on pincers, leaving the first set of this arachnid's legs to function as thin, whip-like feelers. 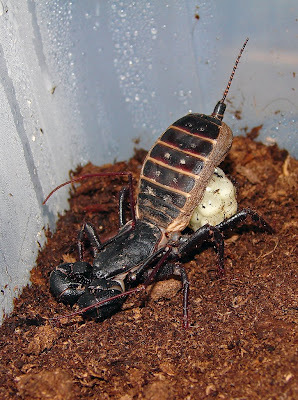 In researching the vinegaroon, I discovered a new word: cephalothorax. This is the part of the body of an arthropod that includes both the head and thorax (mid section) of its exoskeleton. I have a neckless uncle who I would consider to have a cephalothorax. This lady to the left is gravid, and she's toting her most recent egg sac. Her name is Broken, and her proud owner could not be happier. Thanks for the photos, Vasiliy and Matt.